Hello my tea cup friends. I’ve got a special little treat for you today. 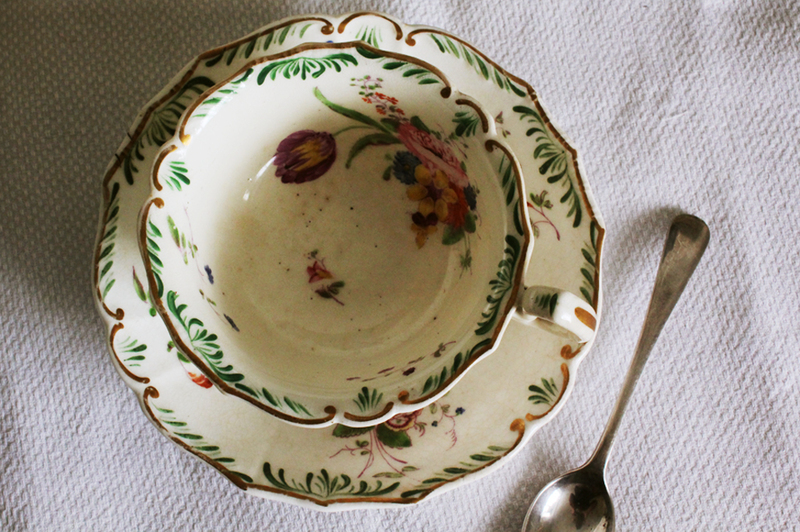 I found this lovely little Victorian tea cup in a tiny antique store in the bucolic Cotswold town of Burford. It’s hand painted with very quirky little brush strokes and only has a number, 7003, painted on the bottom of the cup but nothing else to indicate any maker. It’s a little pockmarked with time but charming, don’t you think? I also wanted to show you this little thing. 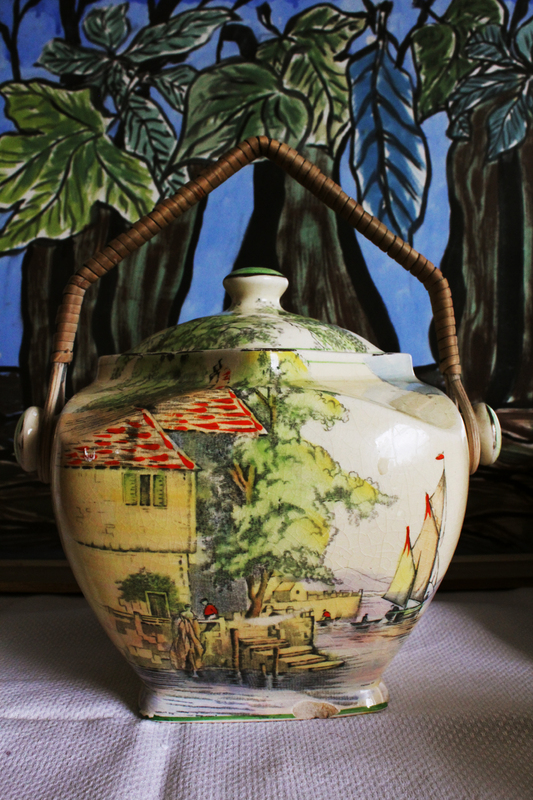 I wondered and wondered about it, because it looks like a tea pot without the spout, and it revealed itself to be a biscuit tin! And now I want to tell you what I found out about this little cup. Do you see how deep the saucer is? It was perfectly socially polite for the fine lady to pour the contents of her cup into her cooler saucer and drink it from there! And the saucer holds the complete cup worth of hot tea. And here are a couple of images of “The Merchant’s Wife” two paintings by the Victorian Russian artist Boris Kusodiev of ladies sipping their tea from the saucer. Enamelling a necklace! Would you like to learn how? I did, it's not that hard. Enchanting cup; my first thought – What memories and whose hands held this teacup? Oh so true Esther! 🙂 Maybe we an make up some stories starting with the child labour which probably produced this cup. 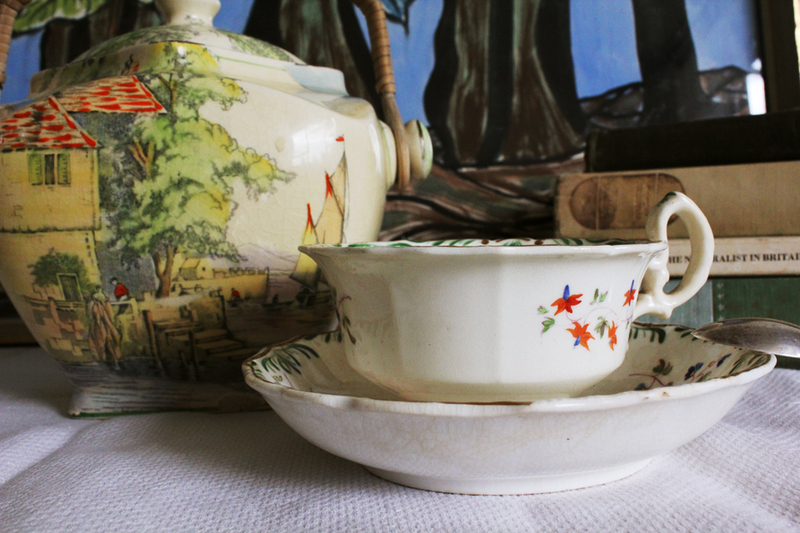 Lovely finds – the scene on the biscuit tin looks dutch. How fun and so glad you shared at Tea InThe Garden! How nice of you to join us from merry old England! Your teacup is darling and I love the deeper saucer. 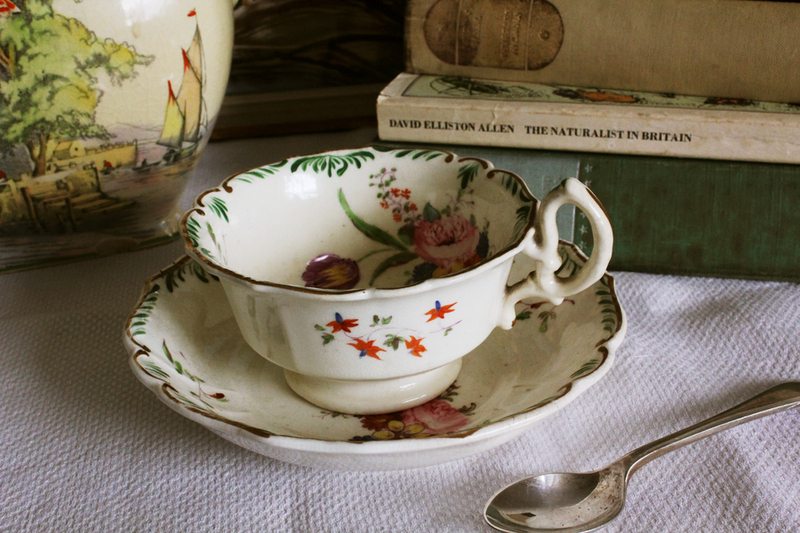 Teacups have such fascinating histories, don’t they? 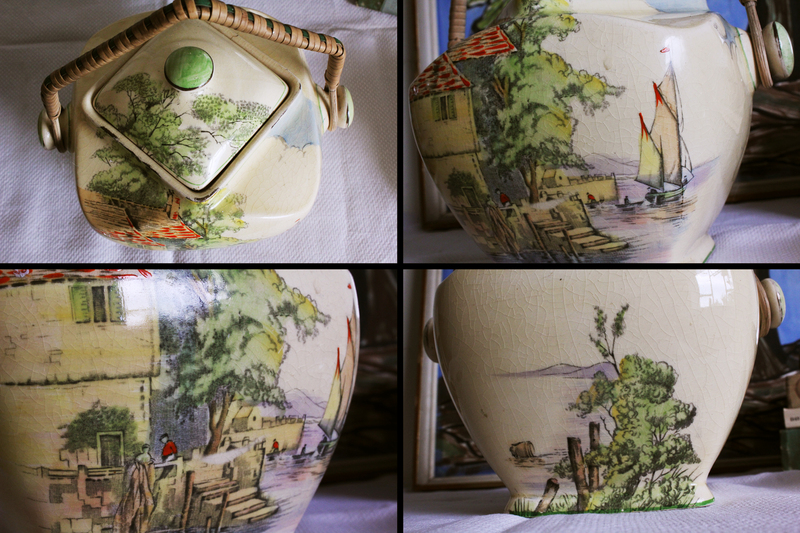 The biscuit jar is a wonderful find and I like the shape of it. How fun to bring these treasures home with you and put them to use. Thank you for coming to tea and take care in the thunderstorm! 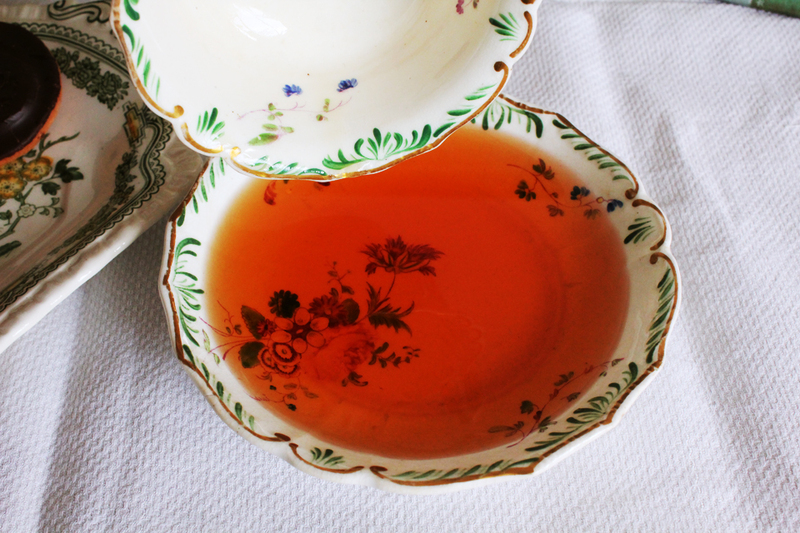 Your newest tea cup is a wonderful find! It is defiantly older. And yes, one would drink out of that deep a saucer. I have never tried, as I find it hard not to slosh tea even in a cup. lol! I can’t imagine not spilling a saucer of tea! The biscuit tin is wonderful too. All that gorgeous scenery painted on there. Wow! You are having fun! I am loving seeing Kusodiev’s paintings. How vibrant in color! Thank you so much for including artwork in your tea post, it is an enriching experience to see her holding her saucer full of tea. elle est ravissante cette tasse ! une très jolie forme ! merci pour ce renseignement que j’ignorais sue le fait de bonne à la soucoupe! I didn’t know either Sophie. It’s interesting, isn’t it? What a lovely post. Beautiful additions to your collection. I love the information about the Victorian ladies sipping from their saucers. 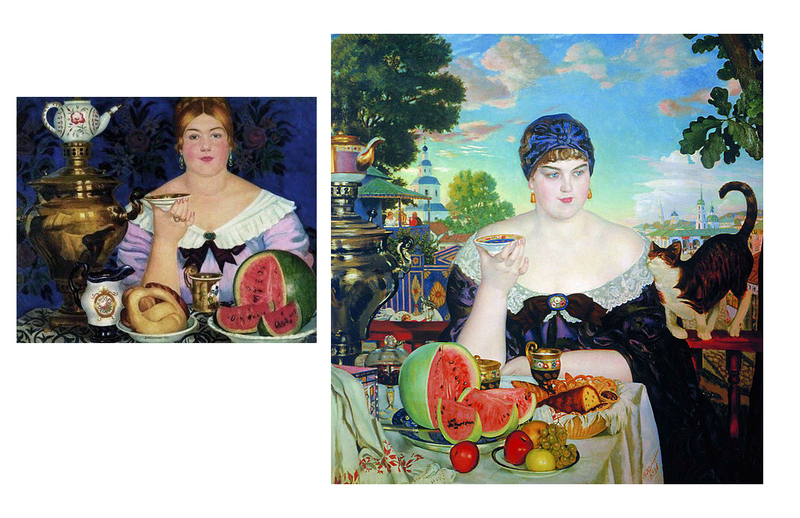 you should look at Boris Kustodiev’s paintings of merchant class women drinking tea from a saucer. Very Russian of that era. 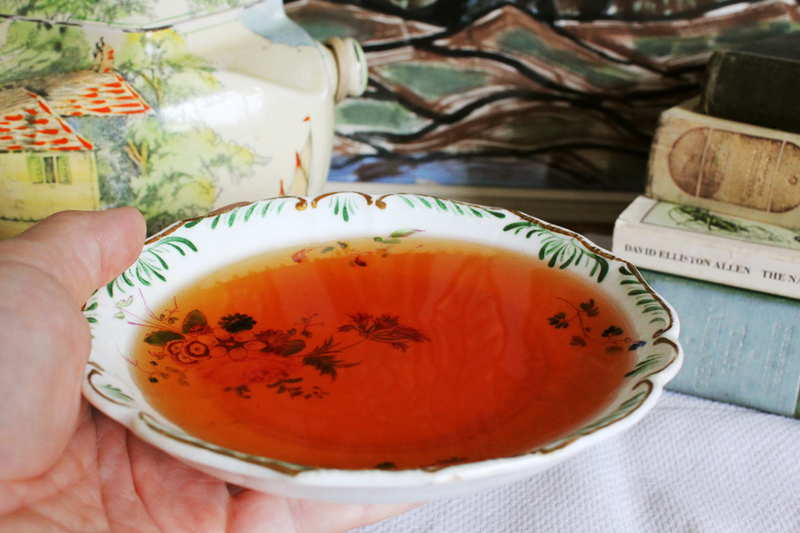 My grandmother from the Jewish shtetl even in Brooklyn taught my sister–who ruined her teeth–to drink tea from a saucer–to cool it from the hot cup–and letting it pass through a chunk of sugar held between her incisors. Typical. Now that tradition is all gone. 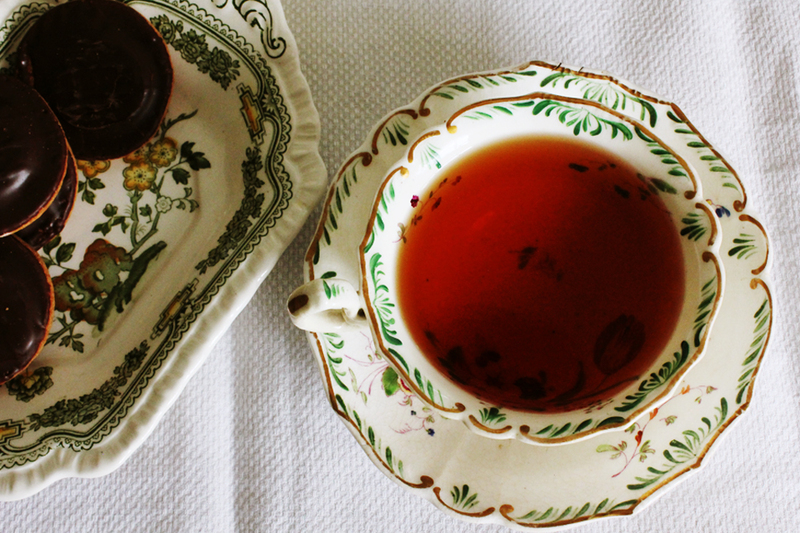 Women drank tea from cups and saucers, men from glass set in a metal holder with a spoon nearby to take a spoonful of raspberry jam into the mouth and sip some tea and sweeten it as it went down the gullet. This cup of yours is much closer to the cups of old Russia!